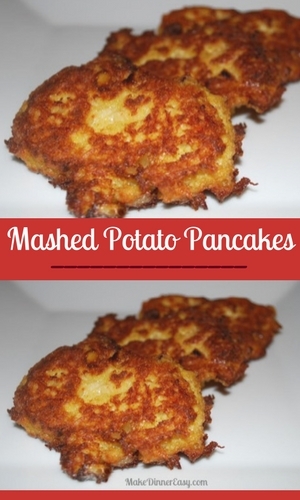 My kids love these potato pancakes. Actually, maybe they just like eating the sour cream or apple sauce that they put on top! When ever I make mashed potatoes, I usually try to make more than I will need so I can make this quick and delicious recipe the next night. 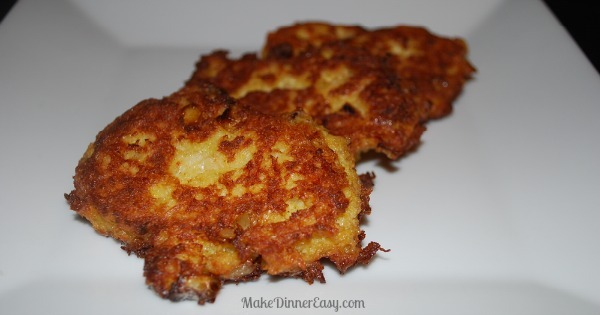 I used to make potato pancakes by grating raw potatoes, but I really like the ease of preparation that this recipe offers. One key to success I've found is to make the pancakes fairly small, about 2 1/2 inches in diameter. A smaller pancake is easier to flip and cooks more evenly. Combine the first 5 ingredients in a medium sized mixing bowl. Heat about 2 Tablespoons each of butter and vegetable oil in a skillet. Place about 2 Tablespoons of the potato mixture into the skillet, flattening the potato mixture into a flat patty with the back of the spoon. Cook until golden brown on both sides. Transfer to a plate lined with paper towels. Blot top of each pancake to remove any excess oil.